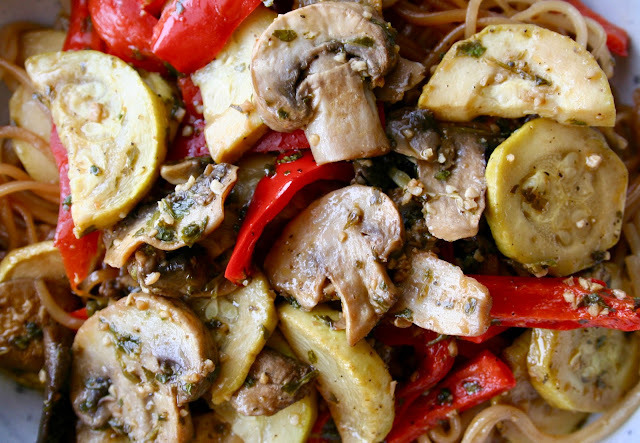 These Roasted Thai Veggie Bowls are everything I dreamed they would be and more! I switched the original recipe up a bit so they'd be easier to make year round and I loved the result. You really could use any veggies you want, but I loved the combination I used. The cilantro marinade is what makes all the difference and I couldn't believe how much flavor it created in the dish. 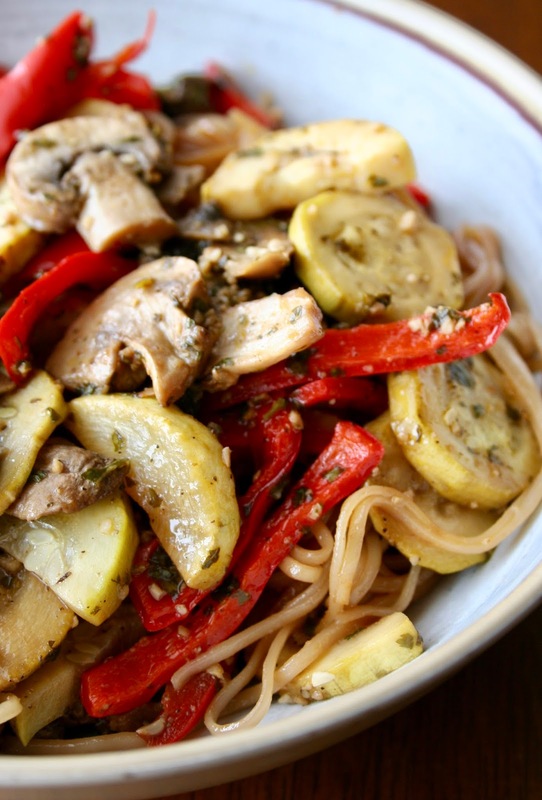 You do make a light sauce for the rice noodles, but all the flavor is packed into the roasted veggies. If you need a lighter dish to start the new year that is PACKED with veggies and flavor, this is the dish for you! 1. Place the cilantro, garlic, soy sauce, water, pepper, sweet chili sauce in the bowl of a food processor or blender and pulse to form a paste. With the processor running, pour the oil through the lid spout in a slow stream. Use a spatula to scrape the marinade out of the processor and pour it over the vegetables. Toss well, cover, and refrigerate for at least 15 minutes. 2. Preheat oven to 425 degrees F and spread vegetables on a baking sheet into an even layer. Bake for 20 minutes. 1. Whisk together the soy sauce, vinegar, sesame oil and brown sugar in a small bowl. Set aside. 2. While vegetables are roasting, cook the noodles according to package directions. Reserve 2 tablespoons of the boiling water before draining the noodles. 3. Return the noodles to the pot and set the heat to medium. Pour the prepared sauce mixture into the pot along with the reserved water. Toss well and cook, stirring occasionally, until the sauce clings to the noodles. 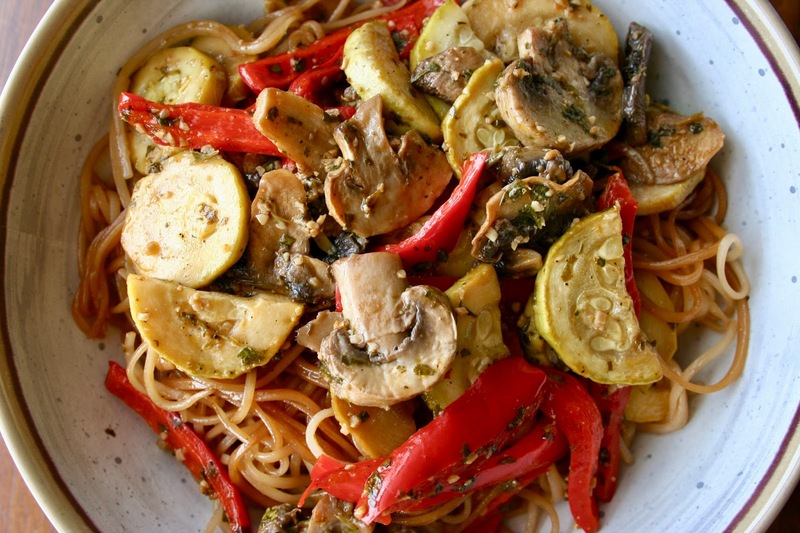 Transfer to individual bowls and top with roasted vegetables.